TRY A PAST PRESENT AND FUTURE READING! ELEMENTAL TAROT APP IS HERE! Ben Astrop has created Caroline's beautiful images in high-resolution detail on Android, iPhone, iTouch and iPad. Simple intuitive interface. Easy to learn system based on numerology and elemental symbolism. More Interpretations and descriptive text than any other tarot app available. New in depth unique interpretations for daily, past, present future. 3 Spreads - Daily - Past, Present, Future - Elemental. Full astrological explanation for each card. Extensive manual on the cards and how to read them. 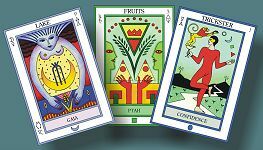 View the cards by suit at your leisure and learn the deeper secrets of each card. Email your readings and screenshot of your spread to yourself or friends with a tap of a button. Special realistic shuffle algorithm to ensure truly random deals. More features to be added in future updates.